In Web development file or image upload is a very required feature. There are many ways we can store images. One we can upload image on server and store image name in Mysql database using PHP. In another way we can directly store images in Mysql database table using PHP also. There are many post we have publish on upload single image or multiple images on server and store image details in database using PHP. 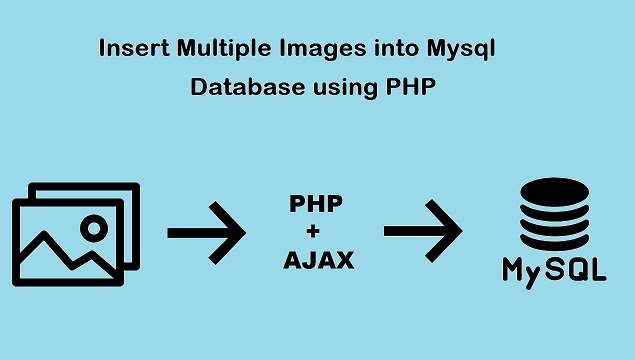 But in this post we have convered one advance topic like how to insert multiple image in mysql database using PHP with Ajax. In one of our previous post we have step by step describe how to insert and fetch images from Mysql database using PHP. But in that post we have use only PHP script for insert image into mysql database and then after fetch images from Mysql database and display on web page using PHP. But here we have make one form with option like select multiple images at the same time and by using jQuery Ajax send that images data to PHP. In PHP script it will convert image into binary string format and insert into Mysql database one by one. After inserting multiple images into Mysql database, now we want to retrieve images from mysql database and display on web page. For this also we have use jQuery and Ajax function which send request to PHP, at PHP script that fetch data from mysql table and convert that data into html format and send back to ajax request. Now we have discuss source of How to Upload Multiple Images in Database using PHP Ajax. Run following SQL script into your phpMyadmin, this script will make tbl_images table into your database. This PHP script will make Mysql database connection. This index file of this source code in this file you can find following things. HTML form for select multiple images from local computer space with image selection validation. jQuery script for submit form data to PHP script using Ajax. Selected image has been send to PHP script using new FormData() object. Ajax script send request for images and display on web page. This insert.php file, in this file you can find PHP script for Insert Multiple images into Mysql database. This file has received ajax request for insert multiple file into Mysql database. First, this script check there is any image file has been received or not, if received then it will check how many image insert has been received. After this this PHP script insert images into Mysql database. Before insert imag into mysql database, first it has convert into binary string format using file_get_contents() function and then at it has make insert query and run insert query and store multiple images into mysql database. This PHP script received Ajax request for retrieve images from Mysql database. This PHP script retrieve images from Mysql database and after this convert into HTML format and send to Ajax request. For convert binary string to images, here we have use base64_encode() function.